Cloning a peach tree is a matter of cutting a stem from the parent plant. 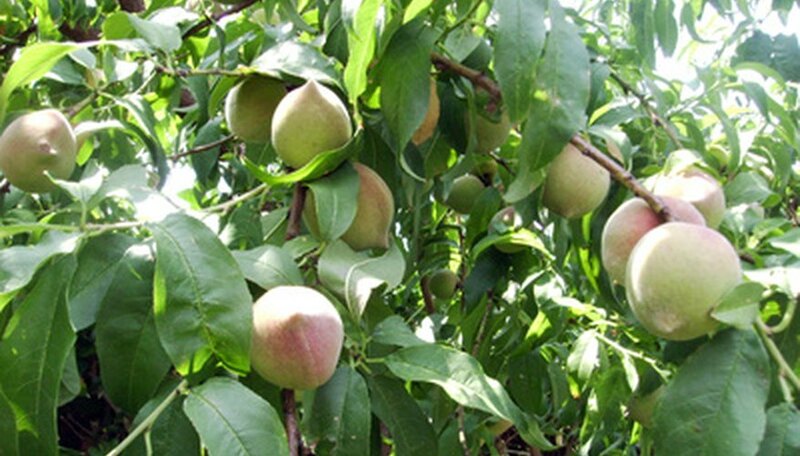 According to the University of Georgia's website, the ideal time to take a cutting from the parent peach tree will be from July to early August. Stem cuttings from parent plants will reproduce an exact copy of that tree. Mix equal parts of the peat moss and sand for the rooting soil medium. Fill the 6-inch pot to within 1 inch of the upper rim of the pot. Add one quart of water to the soil medium. It may take some time to add all of the water. Allow all excess moisture to thoroughly drain from the bottom drainage holes. Select new growth from the parent peach tree. The stems will have a vibrant green color to the limb. Cut a 6-inch long stem from the parent tree. Remove the leaves from the stem on the lower 2 inches from the cut end. Dip the cut end into the rooting hormone powder. Insert the cut end of the stem cutting into the soil medium approximately 2 to 3 inches deep. You can place up to six stem cuttings, evenly spaced, inside the 6-inch pot. Cut the bottom from the 2-liter soda bottle. Keep the top cap in place. Fit the soda bottle over the stem cutting. The 2-liter bottle will fit snuggly inside the upper rim of the 6-inch pot. Set the peach tree clones in a bright location, but out of direct sunlight. Check the soil for moisture after one month. Remove soda bottle. Press finger into soil. If soil is dry, add 1 cup of water. Replace soda bottle over cuttings. Check for moisture every three weeks. Pull upward on the peach tree cuttings after three months. If a slight resistance is felt, the roots are growing. Transplant to individual pots when the roots reach 1 inch in length. Pull one seedling from the pot to check the root length. Replant the individual seedlings, into separate pots, later on in the fall once the roots have been established. Keep the seedlings from freezing during the winter. In most cases, the new peach seedlings can be placed outdoors in a permanent location after all danger of frost has passed in early spring.